...and 47% say there is nothing they can do about it. A recent Fundrise survey of well over a thousand Millennials in the U.S. revealed that more than 62.7% felt unprepared for the next financial crisis. To make matters worse, the survey also revealed that 47.1% of Millennials feel that there is nothing that they can do to prepare for it. It’s not surprising that the generation who grew up during the 2007-2008 Financial Crisis and its aftermath would feel this way, despite the stock market repeatedly hitting all-time highs in 2017. In the 2007-2008 Financial Crisis, the Dow Jones Industrial Average lost more than 50% of its value, wiping out a generation of wealth for Baby Boomers and Generation X. With 83 million millennials in the U.S. holding an average of $75,500 in assets, this means the largest generation is at risk of losing $3.1 trillion in the next financial crisis. Unfortunately, economic crises—though not always of this caliber—typically occur every seven to ten years. August 2017 marks the decade anniversary of the start of the 2007-2008 Financial Crisis. As the stock market sits in the second largest bubble in the past 100 years, Millennials may be leaving themselves in the lurch unprepared for market changes. Not adequately diversified. The typical Millennial is modeling their portfolio on the outdated Modern Portfolio Theory of the 1950’s, by allocating nearly all investments to stocks and bonds in the public market. 42% of Millennials surveyed said that they did not know whether it was important to invest outside of the stock market. As a generation investing according to traditional interpretations of Modern Portfolio Theory, Millennials are not sure why they should or should not invest in the stock market. Without an understanding of the reasoning behind specific asset allocations, Millennials will have difficulty making educated decisions on how much to invest and where. Highly correlated. Although the typical Millennial may think that investing across stocks and bonds provides adequate diversification, this outdated investment model concentrates portfolios in two asset classes, rather than diversifying across multiple asset classes with low correlation. When assets are highly correlated, their prices tend to move in lockstep with one another, leaving those who hold them vulnerable to dramatic market drops. This is why only owning stocks can be incredibly risky. A whopping 77.8% of Millennials surveyed said that they had no interest in investing outside of the stock market. Without diversification outside of public equities, a stock market crash like that of of the 2007-2008 Financial Crisis could devastate Millennial portfolios. Needlessly expensive. Publicly-traded investments are priced at a premium to pay for the benefit of daily liquidity. However, most millennials don’t trade their stocks daily, because they have long-term investment horizons. As a result, Millennials who invest in the stock market are reducing their return by paying for something that they aren’t using. Current market technicals further compound the problem. Historical data shows that if individuals invest only in the stock market at a time when price-earnings ratios are greater than 20, it is likely that their annual investment returns will be less than 3% over the next twenty years. Today, the Shiller PE ratio is 30, the highest that it’s been in history with the exception of the stock market crash of 1929 and the dot-com bubble of 2000. Fortunately, there are easy ways to prepare for a financial crisis, which can benefit Millennials and older cohorts alike. Our research suggests that a modernized version of the traditional asset allocation model, Modern Portfolio Theory 2.0, is better suited to withstand the next financial crisis. Chief among the necessary modernizations of Modern Portfolio Theory 2.0 is the expansion of portfolio diversification across asset classes with relatively low correlation to the broader market. Including assets with lower correlation in your portfolio reduces portfolio risk and volatility. 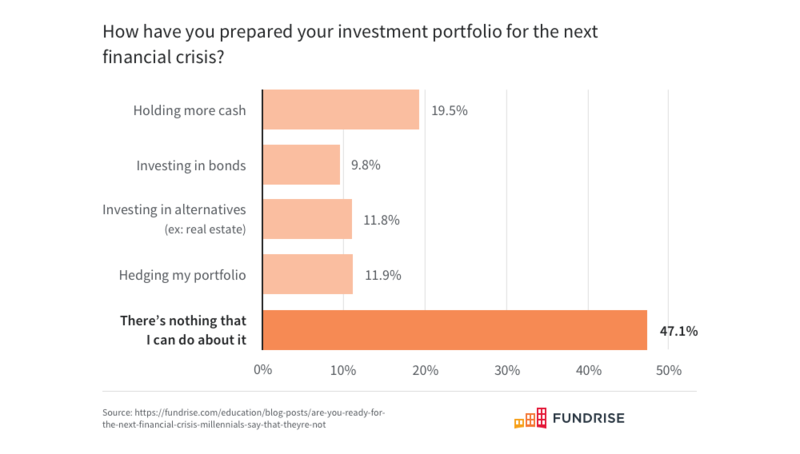 To achieve this, our research shows that it would behoove investors to shake off their tunnel vision of the public market and consider expanding their portfolios to include both public market and private market investments. Allocation to private market investments can increase risk-adjusted yields both through higher return potential and portfolio risk mitigation. For example, the private investment holdings of the California public Employees’ Retirement Systems generated 20-year annual net class returns of 12.3%, compared with 8.2% for its public equity holdings. 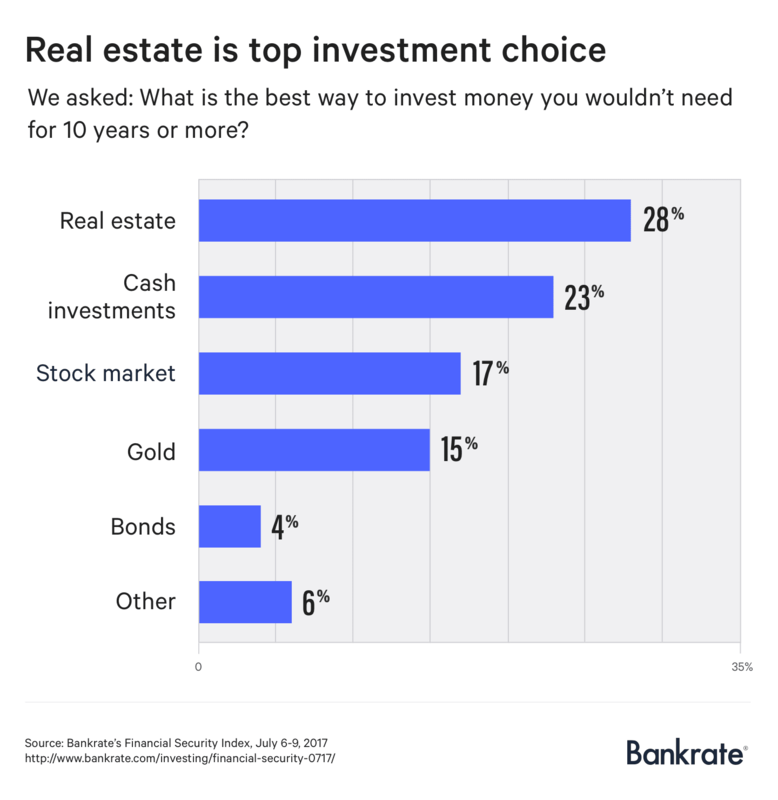 Both the Fundrise survey and a recent Bankrate survey revealed that Millennials have a high preference for cash and real estate. Cash is arguably one of the best ways to take advantage of a downturn in the stock market. Real estate also presents an opportunity for Millennials to invest in a historically high-return asset in the private market. Though industry entry barriers and high capital requirements have prevented most Millennials from investing in real estate in the past, Fundrise has opened up access to direct private market real estate investing to everyone through its eDirect offerings Now Millennials are able to utilize Modern Portfolio Theory 2.0, and create a well-diversified portfolio by investing both in public market stocks and bonds and private market real estate. For a more detailed analysis of the challenges and opportunities the Modern Portfolio Theory in the current market, read the whole white paper study: The​ ​Shortcomings​ ​of​ ​Modern​ ​Portfolio​ ​Theory​ ​In​ ​Today’s​ ​Macroeconomic​ ​Environment.